To understand healthcare of poultry, one must first understand the conditions in a poultry house. Apart from organic production, there are no limits to how many animals can be kept in one hall. Meat chickens and layers are reared in flocks of 10 000 - 40 000 or higher. Turkey and goose flocks are usually smaller. It is easy to comprehend that medication and health checks are flock-based: it is impossible to monitor and care for each individual animal, even though their pains and problems are unique. Therefore a disease outbreak is often noticed as the production or growth of the entire flock are decreased. Viruses and parasites spread nearly immediately to every bird in the flock. If there are several poultry farms in a small area, the disease can spread from one farm to another in car tires, boots, dirty hands, clothing, by wind etc. "Backyard hens" and wildlife are also a risk to commercial poultry producers. Disease control, preventive medication and quarantines are vital in animal import/export. As the bird influenza -epidemics have shown, international and even global disease outbreaks are possible, and carry heavy consequences to poultry and, in extreme causes, to humans as well. Shoe cover sample: Put on dispensable shoe covers, and walk amongst the floor-reared birds. Swap the covers between different sections of the hall. Send the individually-packed dirty covers for screening. Feces sample: Mix an adequate amount (100-200g) of feces from all feces collector mats or different parts of the poultry house. Dust and swab samples: Take and store individual samples from all around the poultry house: floors, corners, feed trays etc. Allow only necessary guests to the poultry house. 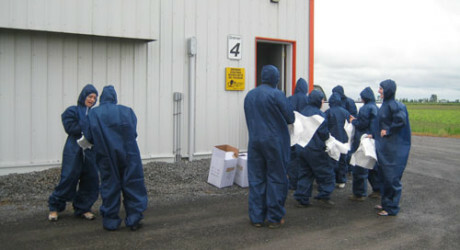 Ensure all visitors wear disposable shoe covers and other protective clothing provided by the farm. Ensure no one enters the poultry house if they've been abroad during the last 48 hours. Follow the official and recommended vaccination and medication programmes. Monitor the animals and production levels closely. Repel indects, flies, rats and other vermin. Ensure wild birds cannot enter the poultry house or feed storage through air ducts or ventilation shafts. Use barriers. Make sure all clothing and equipment used in the poultry house is kept there, and all "dirty" clothes and tools are left in the barrier area. Follow the all-in, all-out method with thorough cleaning and disinfection between flocks. 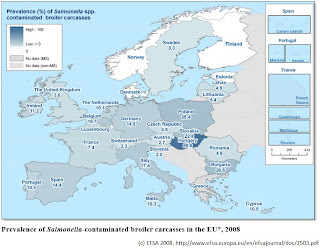 Several bacterial strains can cause salmonellosis. 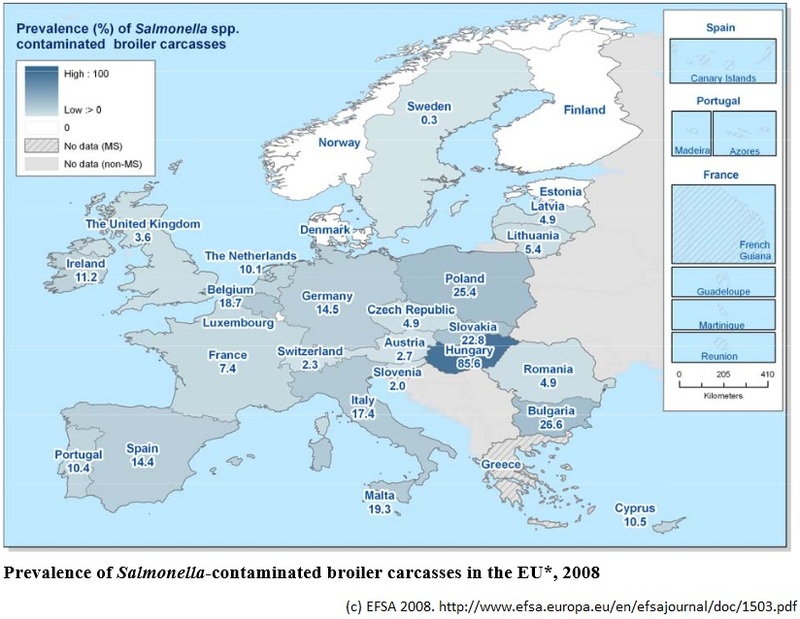 Salmonella Enteritidis and S. Typhimurium can infect poultry and humans alike. Both bacteria are infectious if swallowed, and are common in eggshells and feces. Infection through infected feed is rare but possible. S. galliarum infects poultry only, and may cause 100% morbidity in birds of any age. It survives months in a normal climate, but is susceptible to disinfectants. 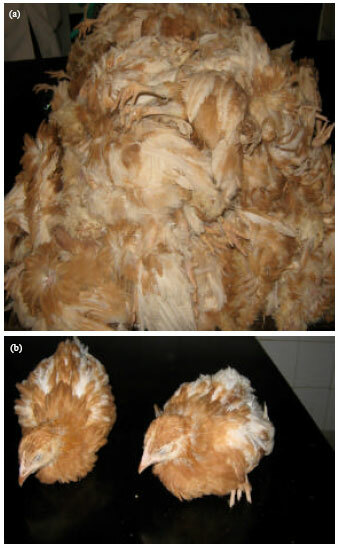 S. pullorum infects only poultry aged three weeks or older. Symptoms of all types of salmonellosis on poultry are ruffled feathers, closed eyes, diarrhea, loss of appetite and thirst and stunted growth. Post-mortem lesions can occur. Morbidity is low to medium. Salmonella can be cured with antibiotics, which are added to the feed or drinking water. The meat of infected birds may be accepted for normal food processing after heat processing. Poultry can and should be vaccinated against IB. 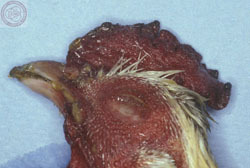 IB is caused by a Coronavirus, which evolves rapidly but infects only chickens. The symptoms depend on the age of the chicken. Chicks get flu-like symptoms. Their oviducts are damaged, preventing them from laying eggs later on. Young chickens show only mild symptoms. Adults have respiratory problems, their productivity decreases and their eggs have faulty shells. Some Corona-strains cause damage to kidneys. IB infection lasts 2-8 weeks. Post-mortem lesions can occur. Morbidity is 0-25 %. IB can be treated with sodium salicylate. Antibiotics are often needed to treat secondary infections by E. coli. ND is caused by some strains of paramyxovirus. In the EU, ND-infections must be confirmed in a reference laboratory in England. The viruses are extremely resistant: it can live months in feces, weeks in carcasses and years in a freezer. ND infects all birds. If an ND-infection is confirmed, a stamp-out may be ordered and all poultry within 3 kilometers must immediately be destroyed. The symptoms of ND vary, but common ones are decrease of production, moulting, hemorrhage of the comb, skin and eyelids, respiratory problems, paralysis and sudden deaths. There is no cure for Newcastle Disease. Typical posture for a hen with MD. Marek is caused by a herpesvirus. It is transmitted as aerosols via respiration, and may infect all animals in a flock in a short time. The virus proliferates in the roots of the feathers, and is extremely resistant. Many healthy birds carry and spread the virus. Marek infects mostly hens, but the symptoms and susceptibility to infection depend on many factors. Most infected are aged 4 weeks or older, most commonly 9-24 weeks of age. Symptoms include staggering walk, paralysis, dangling wings, enlarged crop, bent neck, respiratory problems, eye deformations and weight loss. Sick birds have normal appetite. There is no cure for MD, and even cured birds will get infected again later. Coccidiosis is caused by one-celled parasites of the Eimeria-family. There are nine known contagious Eimeria-species. The infection happens when chickens eat the eggs of the parasite, often brough to the poultry house in contaminated equipment or cargo boxes. The eggs proliferate in the chicken gut, and 4-7 days after the infection there are Eimeria-eggs in the chicken's droppings. The eggs need 1-3 days outside the chicken's body to become contagious. Eimeria infects mostly chickens of 3-6 weeks. Symptoms are increased mortality, stunted growth, decreased immunity, diarrhea, bloody feces, dehydration and decrease in egg-laying. Coccidiosis can be prevented by adding coccidiostates to the feed, and by keeping the litter clean and dry. The only treatment is keeping the litter clean and treating the secondary infections with antibiotics. AE is a viral disease of the central nervous system, affecting chickens, pheasants, turkeys, and quail. Grandparent, parent and production line birds can be vaccinated against AE. Developing fetuses can get infected by the parent, but oral infections may also occur. Mortality is high. Symptoms of AE include sitting, paralysis, tremors, imbalance, muscle weakness and dull apprearance. There are no visible lesions in live animals. There is no treatment for AE. IBDV attacks the immune system of chickens 14-28 days old, causing severe effects in young birds. It is caused by Birnavirus, and infects chickens, turkeys and ducks. White leghorns are more susceptible to Gumboro than brown breeds. The disease is highly contagious, with mortality of 0-20 %. Gumboro increases susceptibility to all other viral and bacterial diseases, including Newcastle Disease. Symptoms of IBDV are depression, lack of appetite, diarrhea, hiding and unsteady gate. There is no treatment, but vitamins and water may help. Antibiotic medication may be indicated if secondary bacterial infection occurs. All laying chickens and parents to meat chickens must be vaccinated against Gumboro. CAV and BWD are different names for the same viral disease caused by Gyrovirus. Mortality is 5-10 %. The virus is very resistant to disinfectants, but is destroyed in 5 minutes in 80 C.
Symptoms of BWD/CAV include poor growth, paleness and a sudden rise in mortality. There is no cure for the disease. Good hygiene and management, and control of other diseases as appropriate, may be beneficial. All parent chickens should be vaccinated 6 weeks before their eggs are collected for incubation. Foot and leg health can be measured by gait scoring, latency to lie -test or post-mortem from carcasses. In gait scoring, a sample size of 100 birds is selected. Each bird is put in a small enclosure, when the animal is encouraged to walk. The gait is scored from 0-5, and the average of all results is calculated. A score of 0 means a normal gait, 3 is a gait problem affecting the animal's locomotion, and 5 means the animal is not able to walk. Gait scoring is a part of Welfare Quality assessment. In a Latency to lie (LTL) -test, 2-4 birds are set in a cage with sawdust litter. After 15 minutes, when the birds are relaxed, 3 cm of lukewarm water is poured to the bottom of the cage. The birds will stand up and stay standing as long as possible before falling down to the water. The maximum measured time is 15 minutes. The longer the birds stay standing, the better their score. 100 birds are tested altogether. Post-mortem examinations are done in slaughterhouses by evaluating the quality of foot soles. This can be done on live animals as well, but may cause unnecessary stress. Same visual evaluations can be done on hocks. Chemical and physical measurements such as tensile strength can also be done post-mortem. The dry matter content and ash composition can be measured from bones. Phosphorus and calcium concentrations in bones can be measured after cremation in a spectrofotometer. This information is quite helpful for those who are in poultry business or studying animal sciences. One should take pre-cautions while handling this business as it affects many of us who buy and eat chicken.